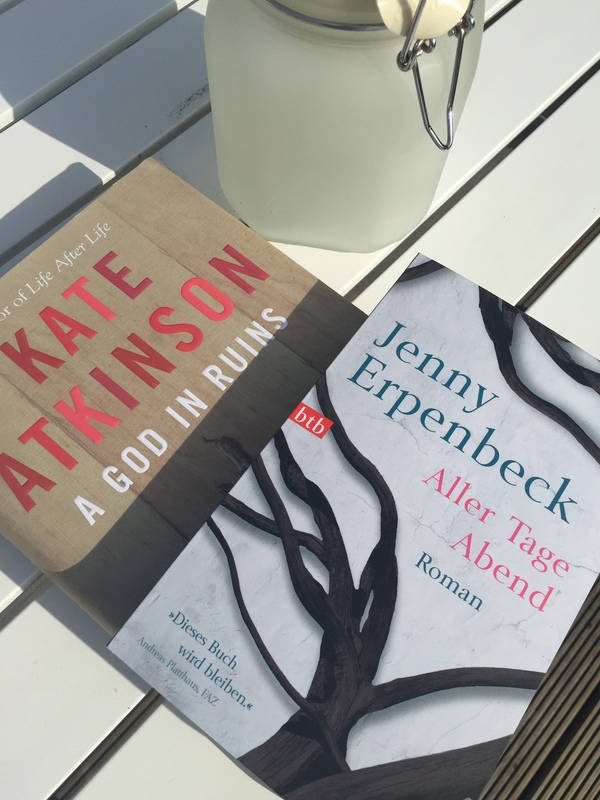 German Book Prize 2015: what have these two books got to do with it?! So! The shortlist of the six novels in the running for the German Book Prize 2015 is out – winners will be announced on 12th October, can’t wait! Click here for a short description (in English) of each novel, the authors’ bios, and an audio-sample. Want to follow the prize and all its goings on in English? No worries, New Books In German (click on the words! ), the prize’s English language media partner, has got it covered. Want to read about it in another language? The first website above can be changed to French, and the second to Spanish – the latter one even mentions Italian content but the link didn’t work for me. Still, quite the polyglot atmosphere! Sadly I haven’t read any of the shortlisted books, shame, but I just haven’t. Reading through the list though made me think of my encounters with the author of one of the shortlisted novels, well not with her directly, but with one of her previous books and with her portrayal in an interview-based article in the Guardian. So this writer is on the shortlist then with her latest novel, Gehen Ging Gegangen/Go Went Gone, of course she is, seeing that in German book terms she’s – and I’m just stopping short of abusing the word ‘literally’ here – everywhere: Jenny Erpenbeck. Erpenbeck’s sixth novel Aller Tage Abend/The End of Days won the Independent Foreign Fiction prize earlier this year, and that’s just one of the many awards and accolades heaped upon her. If you’re interested in German contemporary writing, Erpenbeck is not a name you can easily avoid. My own ‘Erpenbeck experience’ hasn’t had the smoothest of starts ever since I meant to read Das alte Kind/The Old Child, her debut novel, but ended up mistakenly reading a book of the same title by Zoë Beck, I mean come on, same title, and, then, the author’s name, enough to get anyone confused. Beck, Schmeck, Erpenbeck. What didn’t help either was that Beck’s novel is truly, erm, awful, sorry, and I only finished it because of its twin location setting of Berlin and Scotland, which are both close to my heart. I know that’s not Erpenbeck’s fault, but somehow the momentum was lost. “People don’t tend to believe me, but our default mode in the east was skepticism towards the government, especially among those who still believed that socialism deserved a better chance. When we read a newspaper, the first question was always “What does it really mean?” It gave us a much better training, alertness to manipulation. Sometimes I think that people in the west were much more streamlined, much more easily manipulated with their 100% faith in democracy while remaining largely unquestioning of the economic system”. Wait a minute. Surely “what does it really mean” is everyone’s first question, not just if you grew up in East Germany? 100% faith in democracy? Unquestioning of the economic system? What is this? I don’t recognise it. Sounds like Erpenbeck herself was manipulated into subscribing to a simplistic view of each and every ‘Westbürger’ as an uncritical consumer of capitalism. Very odd indeed. Now apart from the fact that experimental writing is far from uncommon in ‘England’ – just look at contemporary writers Tom McCarthy, Stewart Home, Ben Brooks for starters. Also what puzzles me here is that no reference is made to Kate Atkinson’s Life after Life. Atkinson uses the same conceit of a character living out several different lives within the course of the novel, and she does this, in my (not so?) humble opinion, better. There’s also a strong German connection running through it right from the start; the novel opens with the main character, Ursula, shooting Hitler dead. Bang, take that. Then I dare you to read Life after Life and not fall in love with Teddy, yes I know he is a fictitious character but somehow the understated brilliance of Atkinson’s writing makes you forget that, and yes he did bomb my home town of Bochum with his Halifax, but hey, we’re all friends now. Not keeping your critical distance comes at your peril but works out completely fine until right at the end of the novel’s companion piece, A God in Ruins, which came as a complete shock to me – although I do like to flatter myself as not exactly an uncritical reader. Maybe I should have seen it coming, but I didn’t, just as I never saw it 20 years ago when reading Atkinson’s first novel, Behind the Scenes at the Museum. Afterwards it’s so obvious that it was always there, running through the novel like red thread, but a slim, thin, easily missed one. No wonder Atkinson states that A God in Ruins is about fiction itself – that makes complete sense, and although I felt heartbroken and not just a little duped when I got to the end, I have to agree and admire the intelligence and crafts(wo)manship that went into it. I can’t say that I feel like that about Aller Tage Abend/The End of Days. Yes the style is seductive in its consistent curliness, which feels both old-fashioned and post-modern, and that’s not a bad thing at all. But altogether though I felt more annoyed than intrigued, especially when the number of a spider’s legs are referred to as six, not eight, call me petty, do, but I’ll still feel the same. And the repetitions, and the repetitions… not for me, no really, not for me, for what it counts, and it probably doesn’t, and that’s ok, and not a bad thing either. Have you read any books with a German connection lately, tentative or otherwise? Die Erfindung der Roten Armee Fraktion durch einen manisch-depressiven Teenager im Sommer 1969/ The Invention of the Red Army Faction by a Manic-Depressive Teenager in the Summer of 1969 by Frank Witzel. Ohne Witz. Read more about the winning novel here. I’ve ordered my copy – have you? This entry was tagged books, German Book Prize, German books, German Literature, Jenny Erpenbeck, Kate Atkinson, reading. Bookmark the permalink.